Our digital channels receive an inbound volume of 10 startup pitches daily. That may be a small figure for most big funds, but add those to the startup we dig ourselves, and they trigger a considerable effort on our side: replying to those founders with a proper answer, and inserting a piece of advice when we feel like it. I can remember 5 or 6 very successful startups to which I gave extensive feedback in the past. Because of that feedback, they approached me on every roadshow, even when the round was larger than I could afford. I lost count of how many board seats I’ve been offered on hockey-stick revenue startups simply because of previous feedback I have given (even those sent over email). First of all, thanks for getting back to us. The other funds we contacted haven’t even replied with an automated message after weeks. We’ll get in touch when it’s all done! Startup founders are a key customer for a VC fund. Without them, we have nowhere to deploy the capital we manage; without their work, the process of transforming venture capital into profit is… nonexistent. If they value feedback that much, we should consider it carefully. According to entrepreneurs, most VCs are pedant and self-centered individuals. What do the founders need to understand about the lack of feedback, and how can VCs improve? Even small VC funds have a 3+ people team managing the dealflow and the relationship with entrepreneurs. This includes interns to process superficial contact, analysts to handle the dealflow, and senior analysts or entrepreneurs in residence (EIR) to further analyze potential investments. When a founder starts talking to a fund, a single point of contact may become two to three different people over time – and even before the VC has sufficient information to provide feedback. So it is expected that early-stage startups, the most typical dealflow candidate, think they’re not getting enough feedback from Pete or Kimberly or whoever. After all, that person is just the front-end of a complex process, and those who manage that process aren’t focused on all startup stages – only those specifically applicable to their investment thesis. The remaining founders simply don’t qualify for real feedback; the fund believes a polite automated message will suffice. As you can see, the quality and promptness of the VC feedback is proportional to the entry channel. The first channels above have a higher score, so startups coming from them will receive higher attention when evaluated, prompted or getting final feedback. The further you go into the investment funnel, the more different people you’ll get to meet. To make that worse, different people will have fragmented opinions and will have to converge to achieve a cohesive feedback. With all those levels of attention, it’s hard to get concrete feedback from a VC on the earlier funnel stages. Please say yes! Please say yes! 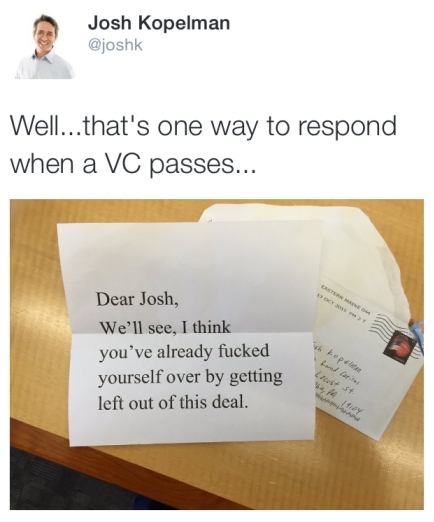 VCs (almost) never say “no”. That happens because most VCs believe they’re able to determine whether a startup will or not be successful in the future – or at least, they think they’re skilled in the art of evaluating the timing and attractiveness of good businesses. If they pass on a company, they may be seen as stupid or visionary… It all depends on how big that startup becomes in the future. The further a startup gets into the dealflow funnel, easier it is to get a “no, thanks” answer. So at some point in the future, VCs will say no… But usually, they postpone the next follow-up indefinitely – which is the equivalent of a “no, thanks” answer. VCs are not in the business of giving feedback – they’re in the business of multiplying money (mostly other people’s) by exiting an investment. Giving feedback to every founder that approaches a fund costs money and time to execute a process they haven’t initially budgeted for. This is why concrete feedback to startups from the top of the dealflow funnel is so underrated and overlooked in the VC world, considering the massive number of entrepreneurs entering the pipes of several funds at the same time. On the other hand, proper feedback can drastically change a startup’s future, and also how that particular VC is perceived by the founders. Good feedback shows them how to improve: it helps startups to do more faster, and understanding how attractive they are (or not) to a particular VC’s investment thesis. The secret lies in the balance. We’re still trying to find the answer, and keep giving feedback to all applications we receive.